As previously reported on this site, there is an Outlander panel at 5:30 on Saturday, October 6th, and the panel will last until 7 PM. Ronald D. Moore, Maril Davis, Caitriona Balfe, Sam Heughan, Richard Rankin, and Sophie Skelton will be on the panel. As with previous con panels for Outlander, a video of the panel will probably be shared by Starz within a couple of days of the event. It will not include any exclusive footage (or the first episode) that is only meant for those attending. Live-streaming of the panel will not be an option for those not in attendance. There will be an Outlander booth at NYCC. It will be Fraser’s Ridge themed and it will be located at the Inner Roadway of the Javits Center. We do not know if there will be any merch giveaways at the booth. There will be an autograph signing at the booth at 2:30 PM on Saturday, which is before the panel. 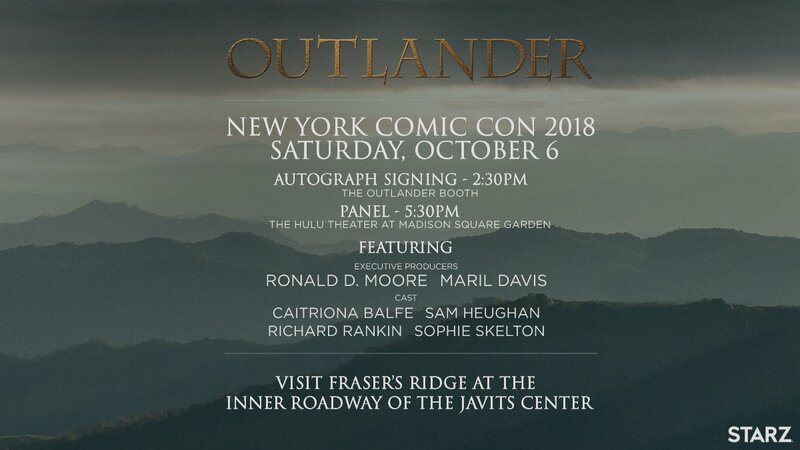 If this works like previous cons, you will need to head to the Outlander booth and see if you can win a ticket to the signing. I would suggest you head to the booth as soon as you get to NYCC to learn any of the details. Starz has said that if you get an autograph ticket, you will get VIP seating to the panel that day, so you will not have to worry about losing a seat for the panel to attend the autograph session. Dinna fear! Those who win autograph signing tickets at the #Outlander booth will receive guaranteed VIP seating at the panel. More information will be provided by the booth’s brand ambassadors. The cast and crew of Outlander will be on the SYFY Wire Stage at 11:15 AM on Saturday, October 6th. Tara Bennett will be moderating the session. There is seating at the stage, but please check for the location when you get to NYCC. There will be a live-stream of this session for those not in attendance. Ronald D. Moore is doing a master class with Chris Parnell (Sony Television executive) on Friday, October 5th from 3:30 – 5 PM at The Studio at NYCC. Tickets are $50 and are still available. Caswell-Massey will have a pop-up shop at the Javits Center in collaboration with Starz’s Outlander. There will be free gifts! Tomorrow through Sunday, we are going to be hosting an exclusive pop-up Apothecary shop in collaboration with @Outlander_STARZ. If you're located in New York City, come visit us at the Javits Center to get some exclusive free gifts and experience a heritage Apothecary! Author Diana Gabaldon will be on a panel on Sunday, October 7th at NYCC. The panel is called “Pages to Pictures” and is from 10-11 AM at the Shop Studio. She will then be doing a signing at Penguin Random House’s booth from 11:30-1:30 PM. If you're in New York and not busy this weekend…come see me at Comic Con on Sunday! I'll be doing a panel called "Pages to Pictures" from 10-11 am at the Shop Studio location, followed by a signing event at Penguin Random House from 11:30-1:30. Details on room/hall tomorrow! 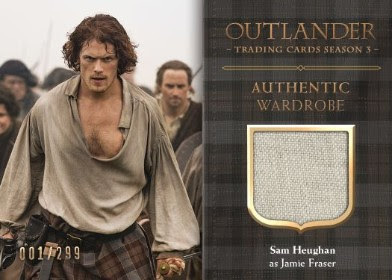 Cryptozoic will have two exclusive limited edition Outlander season three wardrobe cards available at their booth (#244) available for $25 each. 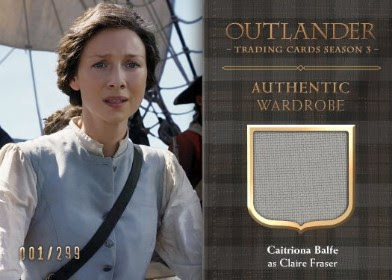 One features a Jamie costume and the other is a Claire costume. 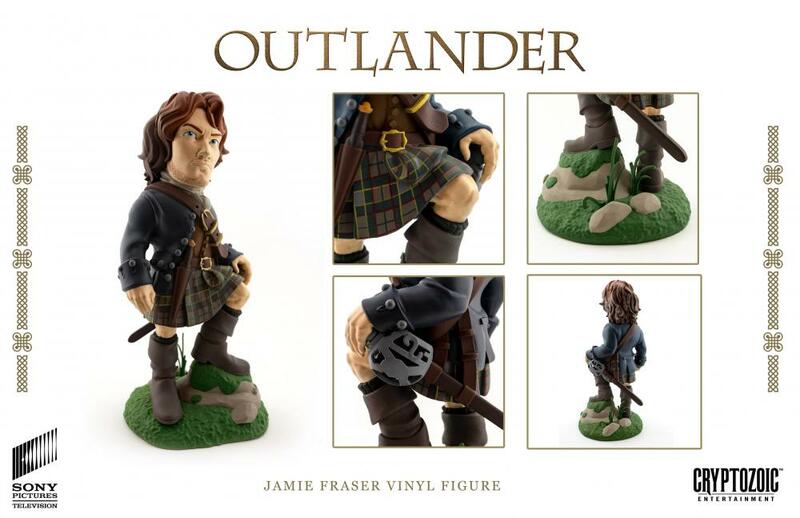 They will also have the Jamie Fraser figurine available for $40 at their booth. This entry was posted in Caitriona Balfe, Diana Gabaldon, Events, Maril Davis, Merchandise, New York Comic Con, Richard Rankin, Ronald D. Moore, Sam Heughan, Sophie Skelton and tagged Caitriona Balfe, Chris Parnell, Diana Gabaldon, Events, Maril Davis, NYCC, Richard Rankin, Ronald D. Moore, Sam Heughan, Season Four, Sophie Skelton by Sarah Ksiazek. Bookmark the permalink.